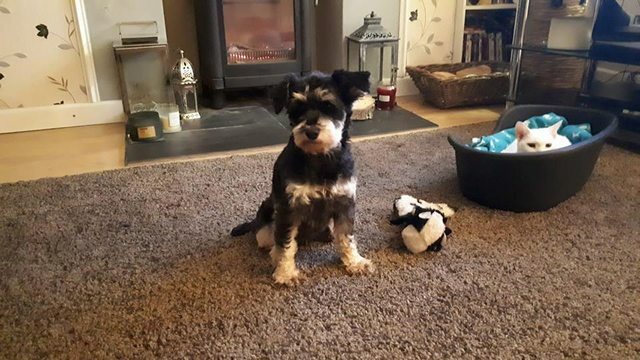 Bridgette is Miniature Schnauzer who is around 2 and a half years old. She is being fostered in Rhondda, South Wales and is a timid little girl who is coming out of her shell. She is starting to trust humans again. Bridgette loves welcoming her foster family home. Sitting on laps and laying between her humans on the sofa is her favourite pastime. Bridgette loves all humans when she gets to know you. People can touch her head and upper body but she is very nervous when touched around her back and lower body. We think she will be okay with older children. Bridgette is timid around new dogs but will relax after a time. We will only rehome here where there is a resident dog of a similar age. Bridgette can live with cats. Bridgette is mischievous and pulls labels off things and has been known to destroy toys. She doesn’t like unexpected loud noises although she is used to household appliances now. She shows interest in TV if dogs are on but really dislikes any horses on there. Her housetraining is a work in progress. Bridgette will wear a harness and collar but lead training is a work in progress as she won’t walk with her lead on at the moment. She definitely needs another dog either a similar age or older. No bouncy pups please. A stay at home family would probably suit Bridgette and a family who will work with her lead training and house training. Her family must have time and be tolerant to her needs. 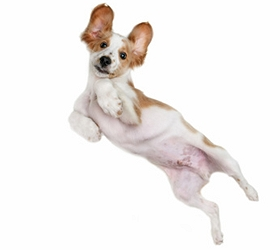 We think people who have had ex-breeding dogs experience would be best for her and someone who won’t rush her and let her do things in her own time with guidance. Bridgette a lovely little girl who will thrive given time, patience and love. Please remember, if you have a dog and it is not neutered, it is against our policies to re-home a dog with you. Bridgette is neutered, chipped, vaccinated and up to date with her flea and worming treatment. Potential adopters will be expected to travel to meet her in her foster home in Rhondda, South Wales. If you are interested in adopting Bridgette please read about our rehoming process and complete a Pre-Adoption form ( link here ) and one of our adoption coordinators will contact you for a chat. For further details regarding Friends of Animals Wales (formerly Friends of the Animals RCT) please visit https://friendsofanimalswales.org.uk/category/dogs where you can complete a homing questionnaire, read the adoption guidelines and find more information about the animals in their care. They rehome all across the UK so distance is no problem. Set donation fees apply.